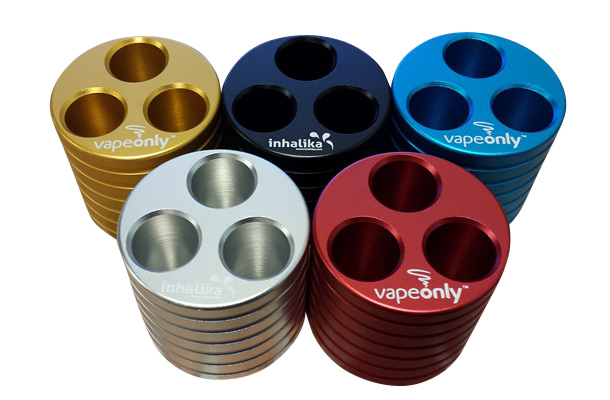 TheThree-port Cylinder E-Cigarette Stand Base/ Holder can work with eGo/eGo-T/eGo-C/eGo-C Twist battery with the capicityof 1000mA or less.. The bases are well-made by finish turning, sand blasting and oxidizing. It has three holes and can hold three batteries at the same time. Diameter 4.4cm ( 3 holes:1.5cm) Hight 4.0cm material Aluminum. From Larry of Frankfort, Kentucky on 8/8/2018 .